Garments are easy and quick to make but sewing with jersey knit has certain challenges. Be aware of that and know how to handle them, they can revolutionise your sewing. How do I recognise knitted fabric? Look carefully at your sweater. Do you see the little interlinking loops and ‘V’ shapes? Well look closely at a T-shirt and you’ll see the same loop pattern; only much smaller. This is single jersey knitted fabric. The right side looks smoother and there are columns of ‘v’s. The wrong side will show rows of interlinking loops. If one thread breaks, it will form a hole. It has stretch in both horizontal and vertical directions. Single jersey knit can have the pattern knitted in (usually in a striped or grid-like pattern) or it can be printed. When cut, single jersey fabric will curl. Double knit fabric looks like the ribs on your sweater. It’s similar on both sides, having columns of ‘v’s on both right and wrong sides. When cut, double jersey fabric will remain flat. There are other more complicated structures of knitted fabric available such as tricot, interlock, velour/terry, and warp knits such as power net. Knitted fabrics can be made in many fibre types from 100% cotton, cotton/nylon/polyester blends, and with or without spandex. Lycra is the brand name for spandex manufactured by the company ‘Du Pont’. Fabrics containing spandex are more elastic and will recover better than pure cotton fabrics. So when buying fabric, check the fibre content label to avoid baggy knees on your leggings. How do I measure the degree of stretch? Not all knit fabrics stretch by the same amount and your chosen fabric needs to have a degree of stretch that’s suitable for your pattern. To determine the percentage of stretch, fold your fabric on the cross-ways grain. Place 10 cm of fabric against a ruler and pull. If it stretches easily to 12.5 cm, then you have 25% stretch. If it stretches easily to 15 cm, then you have 50% stretch. Fabric will stretch beyond its actual stretch percentage so don’t pull too hard. The pattern envelope will likely have a ‘ruler’ printed along the edge and will tell you what percentage of stretch is recommended. What thread should I use when sewing jersey fabric? Most thread available today is polyester or cotton-wrapped polyester. These have a degree of ‘give’ so are suitable for using on all knit fabrics. If you use 100% cotton thread, it will very likely snap once the garment is being worn and any stress is placed on the seam. The fabric will want to stretch with the wearer’s movement, but the thread won’t be able to cope with the movement. What stitch should I use? 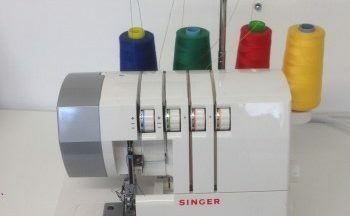 Ideally, use an overlocker (serger) for sewing knitted fabrics. The 4-thread stretch safety stitch is perfect for sports and leisure wear. There are 2 needle threads so it’s more secure where the seams will be under stress. However, a 3-thread stitch will be fine for most applications on mid-weight knits. An overlocker will stitch the seam, trim excess seam allowance, and neaten the edges all in one operation. To learn how to use an overlocker, try my Know Your Overlocker class. If you don’t have an overlocker, then most domestic sewing machines have an overedge stitch which is the nearest alternative. An advantage of this stitch is it will control the curling of the cut edge as you sew if you trim the seam allowances first. Check your instruction manual to find out if your machine has a range of stretch stitches and try them too. Alternatively, use a narrow zig-zag stitch (around 0.5 to 1mm wide). The seam will look like a straight stitch once sewn, but should have sufficient elasticity to cope with the stretch of the fabric. What needle should I use? When sewing jersey fabrics, you should always use a ballpoint or stretch needle. A standard-tip needle can puncture the threads, causing holes in the fabric and skipped stitches. A ballpoint needle, as its name suggests, has a rounded tip so it will push its way between the threads. Choose the needle size according to the weight of the fabric: use a size 70 for very light fabrics, through to size 100 for heavier fabrics. What interfacing is best when sewing jersey fabric? Certain sections of a garment e.g. the neckline facing, or collars still need to be stabilised with interfacing. As these garment pieces need to retain their stretch, then you should use a knitted interfacing. Select one of a similar, or lighter weight than your main fabric to avoid making the area too stiff. If you use a standard non-woven fusible interfacing, it will restrict the movement of the knitted fabric. But a fusible knitted interfacing will not restrict the fabric’s stretch. What pattern can I use for sewing jersey fabric? All the main pattern companies have patterns designed especially for knitted fabrics. Generally they are simpler garments than those intended to be made for woven fabrics. The stretch allows the garments to be pulled on over the head so there’s often no need for fastenings like buttons or zips. Shaping is by utilising the stretchy quality of the fabric so there is less need for complicated construction methods like princess-line seams either. 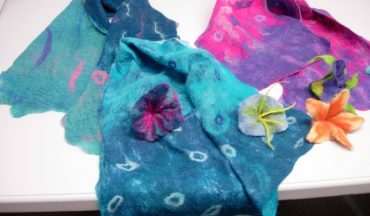 This makes them quick and easy to make once you know how to handle jersey knit fabric. 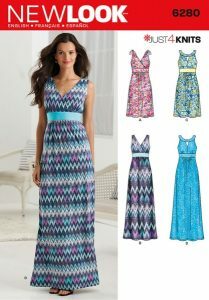 Here’s my pick of a few patterns designed for knit fabrics. New Look has a large selection of lovely options for all the family. Look for those patterns that include 3 or 4 pieces for a whole capsule wardrobe as they represent fantastic value. New Look pattern 6230 for sewing jersey fabric. Knit top, and full or pencil skirt. The raglan-sleeve top would look great with jeans for a for a dressed-down look. Make it in a single colour and it’s smart enough for the office too. But imagine it in a metallic sparkly fabric with stretch lace sleeves and lace skirt for evenings. Ooooh! 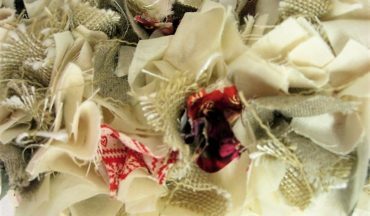 A great holiday option for sewing jersey fabric. 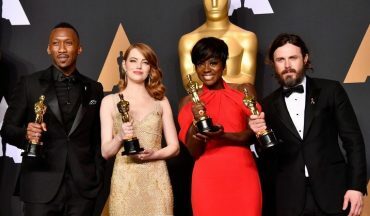 I could have included this dress pattern in my list of Oscar-nominations last week. The long version with the scoop neck and keyhole is straight off the red carpet. But the flattering faux wrap V-neck style is perfect for showing off that holiday tan on those hot summer nights. In a cotton print with a touch of lycra, it’d be a fantastic option to fling in the suitcase without worrying about creases. Here’s another great value package for sewing jersey fabric. There’s 4 pieces in one envelope. The top has 3/4 length sleeves, while the collarless jacket with front lapels is smart-looking but easy to do. When sewing jersey fabric, the neckline and shoulder area of the jacket and top need stabilising. The trousers and skirt have an easy-fit tie waist. These 4 stylish pieces are included for professional dressing options. Did you think that jersey knits were only for casual wear? Pattern no. 6481 is yet another combo offering a ¾ sleeve top, pencil skirt, fitted jacket and side-zip trousers. This outfit is professional enough for a high-profile business meeting or even a stylish ‘Mother of the Bride’. 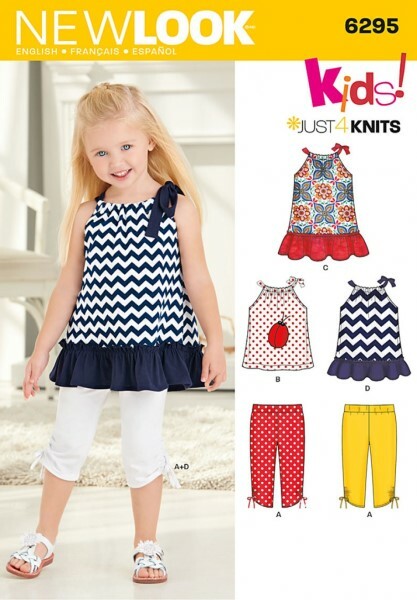 Summer outfits for kids with a dress or tunic option. And for the kids….this little cutie just loves her tunic or dress with a shoulder tie bow and deep ruffle hem. The capri leggings also have a tie below the knees. a versatile his & her pattern – too good to keep for bedtime. Here’s a unisex top, pyjama bottoms and robe package to keep all the family snug. But these are far too nice to keep just for bedtime. The top and trousers would make a great yoga outfit or for weekend shopping trips.